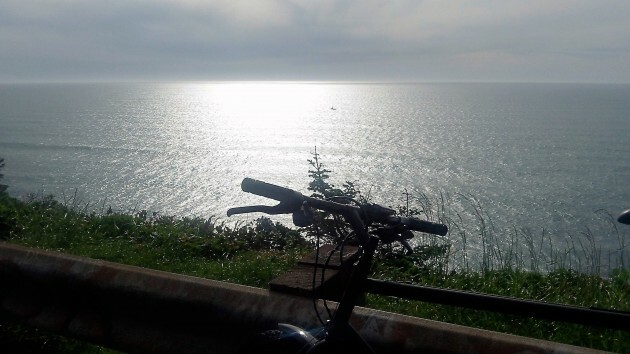 On the bike at Cape Perpetua: Aren’t we green enough yet? Instead, the organizers under the auspices of the College of Liberal Arts are calling it: “The Thin Green Line: Creative Resistance to Fossil Fuel Development in the Pacific Northwest.” A graphic on the workshop’s poster shows Oregon, Washington and British Columbia standing between the Canadian tar sands, the Bakken oil fields and the Powder River coal deposits on one side and, on the other, the routes by which those energy riches might be exported. We’ve seen this green line working for some time. One export proposal after another has been killed or slowed down until it died. Loading terminals on the coast and on the Columbia, natural gas pipelines from the interior to coastal ports, and even coal and oil trains have come under environmental fire. We could use better natural resources, such a solar … but solar doesn’t work near as well these days since they are using their “solar radiation management” and whiting out our skies. Hemp is a fantastic alternative to burning oil … let’s get busy on learning about that, too! Follow a positive Amtrak entry with a pointed jab at “greens” aka those of us who like the seasons as they currently are. Spring (currently) Summer, Fall, Winter, Repeat. Change is happening. I don’t care the cause. Let’ just ADMIT it is. …..and talk solutions. So here we are. Another attack on folks who actually believe in science. Far be it for conservatives to accept the fact that the Earth travels around the sun, or that the globe is round, not flat. Science corrects itself when wrong. Conservatives prefer to live in ignorance. Doesn’t sound as radical as the Earth First or ELF crowds. From what I understand about their goals, the only way to reach them is to depopulate the planet to less than 1 million. They really don’t care how. I don’t agree with the approach that’s taken in the workshop. Having said that, having the discussion is healthy. If we don’t have discussions, we will reach the ELF goal. Well, the activists seem to want to shut down virtually everything related to energy production. I’m still at a loss as to why there is such an aversion to hydro power. I was raised on the North Umpqua and dad was a plant operator for P P & L. No damage to the environment, no pollution, flood protection and river level maintenance. Same with most all other dams, yet we let a select few beat us up on that source of power. If the cry comes out to “save the salmon” then how about terminally exporting some of the over numerous sea lions that gobble up salmon by the thousands. No need to be a conservative to want to remove, lethally if necessary, every last sea lion in Oregon, for exactly the reason you state. They belong in California, not here. Someone at OSU could study the levels of mercury, PCBs, etc, in sea lion meat to determine safety for human consumption. Hunting them might even be a good tourist draw. Of course, there are federal regulations against killing sea lions, along with feathered rats (seagulls). Changing them would need both sides stepping back from their ideological purity. I can hardly believe what I just wrote, since I’m a typical gun-fearing liberal whose outdoor interests are mountain biking and hiking, not hunting and fishing, but I mean it sincerely. The other points you make about hydro power may be valid; I just don’t know enough to comment and suspect the issues (at least on the Klamath River) are very complicated. I could be part of the solution instead of part of the problem. I could vote Republican. There once was the Grand Old Party of Packwood, McCall, and Hatfield. Its principles (at least my perception of them – I could be wrong) included fiscal responsibility and a balance between the environment and freedom to prosper. Their arguments might have persuaded me more than some of the nonsense Hasso describes. Now we have the fearful, moralistic, anti-science, and militaristic (or alternately, isolationist) God’s Own Party of Ted Cruz and Rush Limbaugh. “Moderate” is now just a term of derision. Everyone who doesn’t follow the monolithic party line is a RINO. I make no excuses for the similarly troublesome attitudes of the other side. In November, I might hold my nose and vote for Hillary, or realize that my vote in Oregon is worthless and instead support a third party. age before fire. Alas, if the whole state of Oregon achieved such a goal, the CO2 levels of the earth would still be rising!